We’ve been growing swiss chard for several years and it’s become a family favorite. Swiss chard is one of the few greens we can grow well into the summer without it getting bitter or bolting, it helps cover the transition between our winter and spring gardens. Swiss chard is a great source of vitamins K, A, C and E, along with magnesium, potassium and iron. It also has B vitamins, calcium and copper. How’s that for a multi-vitamin??? Swiss chard is both cold hardy and heat tolerant, making it ideal for growing year round. It’s cold hardy to 15°F, if it gets colder than that you’ll need to use frost protection. 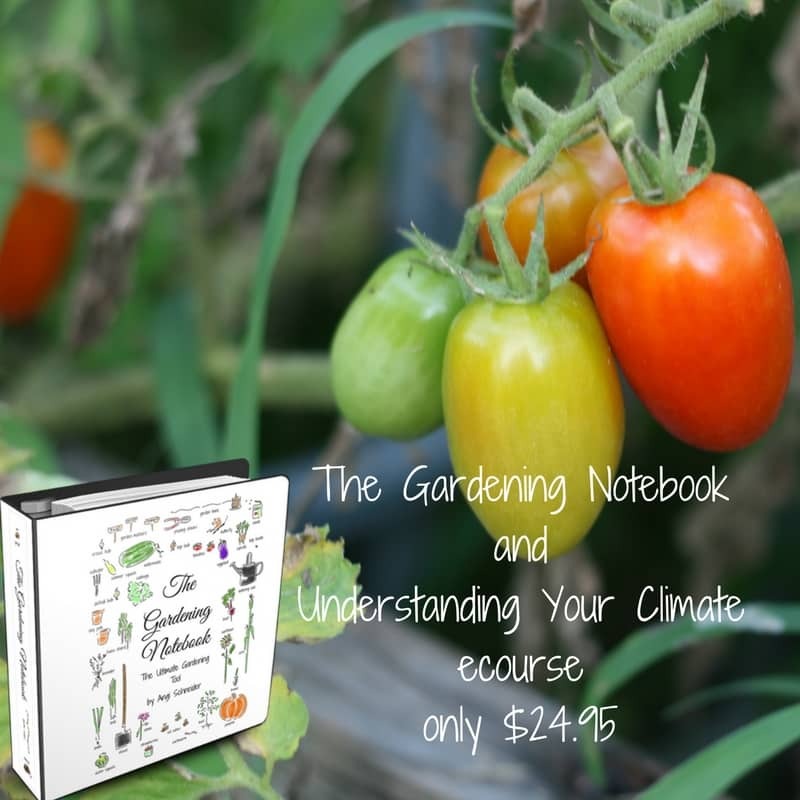 We easily grow it in our summers with temperatures over in the high 90s and low 100s for months on end. Swiss chard can be directly sown in the garden 2-3 weeks before your average last frost date. It’s one of the few plants that can be sown in cold soil so don’t be afraid of starting it too soon. It’s also cold hardy to 15°F so if you get a late freeze it should be fine. 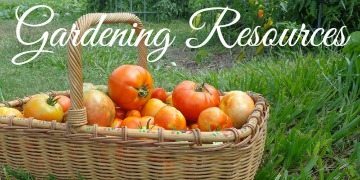 Sow the seeds about 1/2″ deep and about 12″ apart. The plants get pretty big and need that space. The seeds should germinate in 5-7 days. Swiss chard seeds are similar to beet seeds which makes sense since they’re in the same family. The seed is actually a cluster of seeds so you’ll likely get several plants from one seed. You’ll need to thin them out when they sprout. You can use the thinnings in salad. Not only are swiss chard plants cold hardy they are also heat tolerant and should make it through most summers just fine. 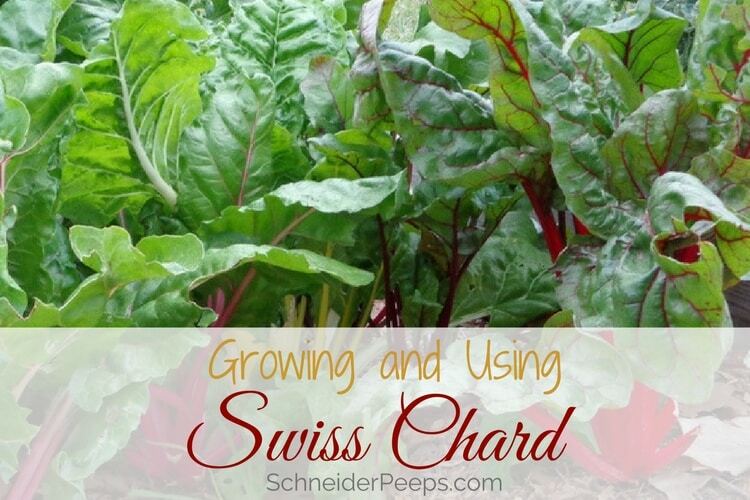 In my climate, we can grow swiss chard year round which is another reason I love it. 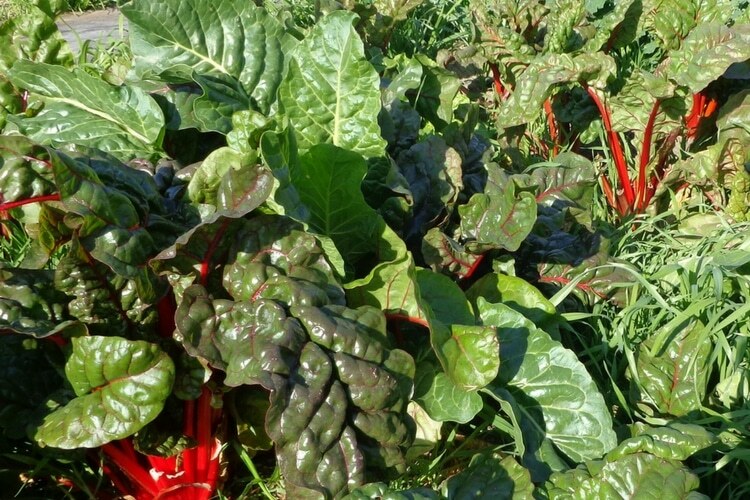 In really cold climates, you can cut the chard back and mulch it heavily for an early spring crop. Because swiss chard can be quite striking, it makes a great addition to your edible landscape and is pretty enough to be out front. There’s an attorney in your area who grows it in pots outside his downtown office, along with citrus trees, blueberry bushes, and other edible goodies. If you need help deciding how much swiss chard to plant to your family I have some free worksheets to help you out. Just enter your email in the form below and they’ll be emailed to you. 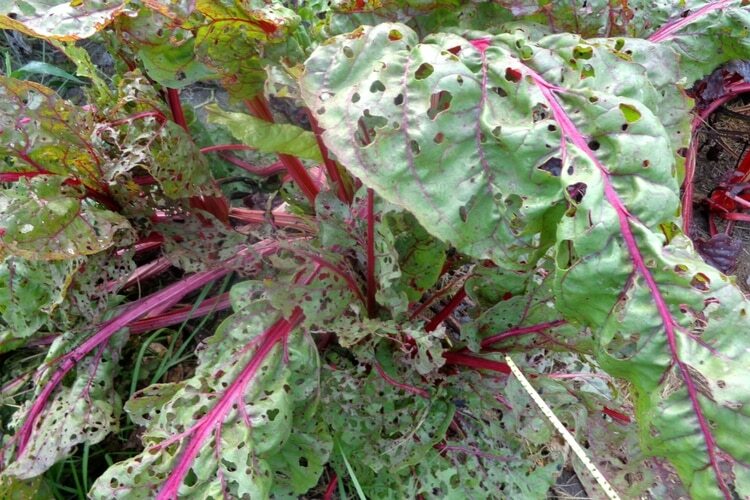 There are very few pests or problems with swiss chard which is yet another reason you should consider growing it. Although it can tolerate hot, dry conditions better than other greens, if it gets too stressed you might find aphids on your swiss chard. Ladybugs like to eat aphids, so you might try purchasing some and releasing them. Aphids like nasturtiums so you can plant some near the chard as a sacrifice crop. – You can also just try watering it more to reduce it’s stress level and make it more resistant to pests and disease. The photo above was taken at the end of a long hot summer and the chard had been growing for 8 months, it was time to give it to the chickens. Leaf miners, cabbage moth caterpillars, and grasshoppers can also cause problems. If they aren’t too bad, I still use the leaves and just cut around the damage or give the leaves to the chickens. If you have a problem of any of these year after year, you can use row covers to protect the swiss chard – just put it on early in the seasons so you don’t trap them inside to feast on the swiss chard. For swiss chard, I just harvest just the outer leaves and let the rest continue to grow. This will allows me to harvest from one plant for months. Swiss chard is a biennial which means it sets seeds it’s second year. It will send up a seed stalk and flower, you can let it go and collect the seeds or cut the stalk off and it will continue to produce new leaves. Because of it’s long harvest season there’s really no need to store swiss chard, although you can. For storage you can chop it up and freeze it or dehydrate it. I will sometimes dehydrate it to make a green powder to put in smoothies, rice, or sprinkle on eggs for a some added nutrition. If you don’t have a dehydrator you can dehydrate swiss chard in the oven. Swiss chard tastes very similar to cooked spinach and so can be used in any recipe that calls for spinach. It’s a little sturdier but not as much as kale. I like to saute it with onions and grated carrots to use as a side dish. We also use it in chicken alfredo, scrambled eggs, soups, lasagna, and rice. The stalks are edible, too. Just cut them up like celery and cook them for a while before adding the leaves. 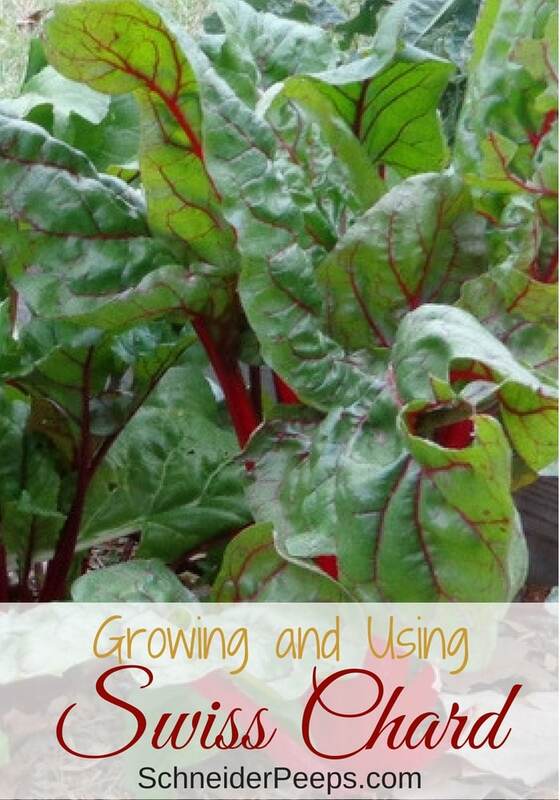 Do you grow Swiss Chard? Any other advice? 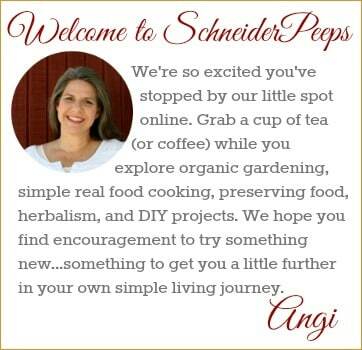 So nice to find your blog! I am enjoying reading thru past posts! We have just acquired our first bee hive, and are really enjoying watching the happenings of those little critters!….hoping they’ll stick out the exceptionally cool and wet spring we’re having here in the northwest – Washington state. Well, I’m off to read thru some of your other posts…gardening and bees! I’m so glad, too. I just clicked over to your blog and your daughter’s music is beautiful! I think I could listen to it all day long. My 15yo son, Gabriel, is the beekeeper. He’s been keeping them for about a year and a half. However, we’re all facinated by them. Today he and his older brother, Christian, were purifying wax and making molds to sell and it was so fun hearing him educate his older brother. I hope your hive does well, too. We’re really enjoying the chard and are thankful for your bumper crop! 🙂 I’ve been substituting it for spinach with great results. We’re definitely going to have to plant some ourselves. My chard got a late start this year but are starting to look delicious. i can’t wait to eat it! Thanks for sharing on Natural Living Monday! Swiss chard is one of my (many) favorites to grow! I use it in just about anything you can think of. I like it because not only can you use it in cooked foods, but it’s one of the greens that are really good chopped up raw as well. I always seem to have a continual harvest, so whatever doesn’t get eaten throughout the (really long) season gets chopped and frozen. I love that I’m able to pull it out of the freezer all winter for soups, eggs, casseroles or just to cook up a big pot by itself. I use it as a substitute for spinach, kale or collards if I don’t have any of those. I can see why this is a favorite. This is the first year we’ve grown it but it certainly won’t be the last. It’s nice to have it to fill in for the times between broccoli/cabbage and zucchini/green beans seasons. 110 degrees!!! Yay. I will try harder with mine. We have some, and we love to grow it every year. This year I had a very low germination rate and we didn’t get as much as we had hoped. Most of what we did have grew slowly so we harvested it as “baby chard”. I enjoyed it because it wasn’t as much work to tear and devein the large leaves. Territorial Seed has a variety called Perpetual Chard that is slow bolting and can be treated as a perennial. I would love to give it a try. I would love to try that also. I actually cook the stems also, I just cut them up and cook them a little first then add the leaves. They’re kind of crunchy but I like them. Thanks for co-hosting the blog hop! I enjoyed your post. We started quite a few Swiss Chard from seed this season and so far so good. We like sauteing it or puttting it in stews. Thanks. That’s how we like it, too. I also chop it up small and put it in eggs or rice or whatever I can get away with. Thanks for visiting. All mine used to get eaten down to the bottom, in the cold frame. Every year. Lats year I put it in pots, and covered with bird netting. Had a good harvest!!! Did you ever find out what was eating it? I bet it’s pretty in pots. I love the look of swiss chard.